"Beecham had a special way with this score, as evidenced by his second recording, made in 1947-48 with young French singers…welcomed for the style….is ‘the’ version to have. It is significant not only for Beecham's deft way with the score (which he had recorded some 10 years earlier in English for Columbia with Heddle Nash in the title part, but also for being one of the last recordings of a French opera made entirely with French singers [who] seem a model of French style. To hear these native-born artists declaiming in their own tongue is pleasure enough in itself, but as they are all masters of their roles, the delight in hearing them is the greater. 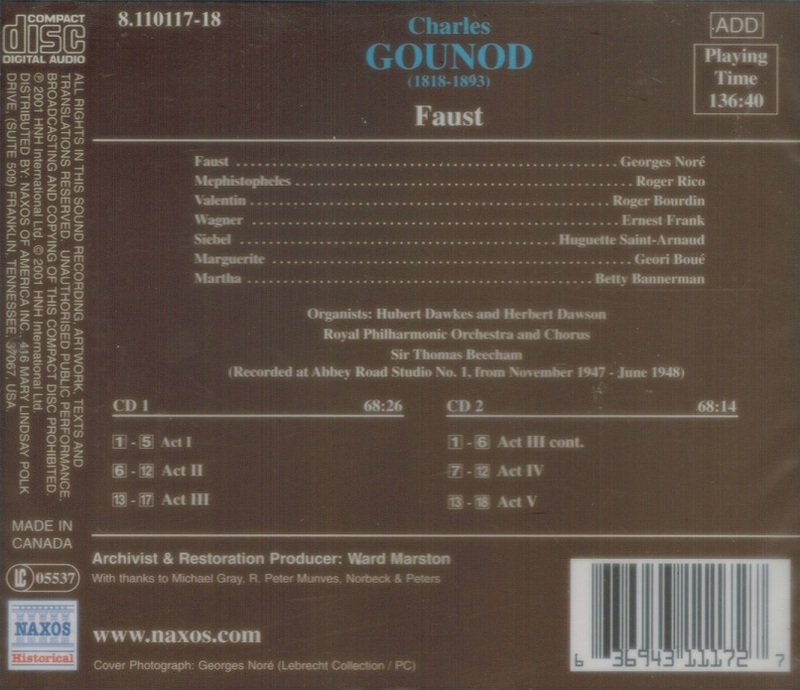 Best of all is Noré as Faust himself. His refined, plaintive timbre allied to his sense of style makes his entire contribution, one flat note in the love duet excepted, above reproach. There are few if any versions of 'Salut demeure' so distinguished, and his high C at the end is perfectly taken. He does just as well in the Garden Scene. Géori Boué is not a soprano to everyone's taste - her tone can sound a shade shrill - but she sings with such a good line, such a feeling for the words, and is so inside her role that she is forgiven the occasional uncomfortable note. Rico's Méphistophèles may lack some devilry, but far better his strong, finely limned singing than the histrionics many non-French basses have imposed on the part. Bourdin is such a good Valentin that one regrets the excision of his aria, a later addition, written for Santley. The supporting singers are more than adequate. Beecham's recently formed RPO covers itself in glory and the British chorus perform with elan as citizens and soldiers. Any younger collector eager to learn how authentically French this work can sound should hurry to buy the set. Beecham enthusiasts will welcome the return of a recording so long unavailable." 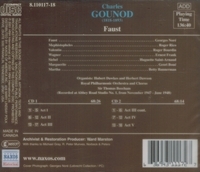 “In his autobiography A MINGLED CHIME, Sir Thomas Beecham gives an account of the lucky part that Gounod’s FAUST played in his own career. Waiting for a chance to introduce an opera of his own to the impresario of a newly established touring opera company in 1902, he found himself called in to provide a piano accompaniment for a soprano who had not brought her music with her, auditioning for the part of Marguerite. He was able to accompany her from memory and when it turned out that he knew all the operas planned for the season and had accompanied the impresario himself in a series of favourite tenor arias, for which he offered increasing praise, he found himself engaged as second conductor for the tour. His services to opera in England were very considerable, from the days of the Beecham Symphony Orchestra before the war, to the foundation in 1915 of the Beecham Opera Company, and in the 1930s an association with Covent Garden. Having lost control of his London Philharmonic Orchestra, which had become self-governing, Beecham established his own Royal Philharmonic Orchestra in 1946, after war years spent largely in New York. In the same year Covent Garden re-opened, not under Beecham, who had had artistic control until 1939, but under Karl Rankl. “To hear these native-born artists declaiming in their own tongue is pleasure enough in itself, but as they are all masters of their roles, the delight in hearing them is the greater. Noré’s refined, plaintive timbre allied to his sense of style makes his entire contribution above reproach." “Roger Bourdin studied at the Paris Conservatory, where he was a pupil of André Gresse and Jacques Isnardon. He made his professional début at the Opéra-Comique in 1922, as Lescaut in MANON. His début at the Palais Garnier took place in 1942, in Henri Rabaud's MÂROUF, SAVETIER DU CAIRE. The major part of his career was to be spent between these two theatres, where he created some 30 roles. Bourdin seldom performed outside France, but did a few guest appearances at the Royal Opera House in London, La Scala in Milan, and the Teatro Colón in Buenos Aires. 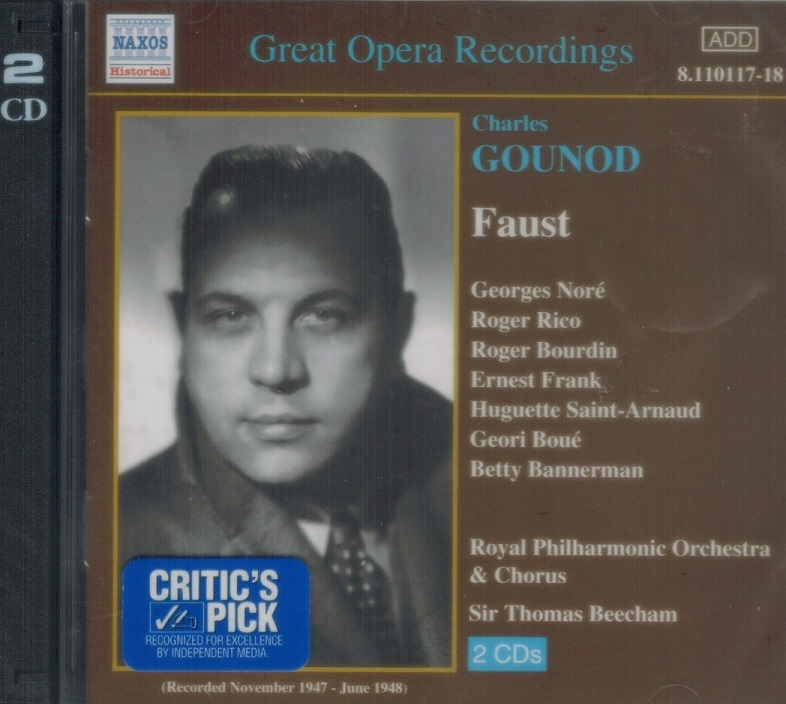 He also sang in the first performance of surviving fragments of Chabrier's VAUCOCHARD ET FILS IER on 22 April 1941 at the Salle du Conservatoire with Germaine Cernay, conducted by Roger Désormière.